That LED forward voltage data of various light colors is quoted from kithub.cc. Specifications can be different depending on the LED manufacturer. The average forward voltage can be considered at least 1.8 volts, with a safe maximal value is 3.3 volts. 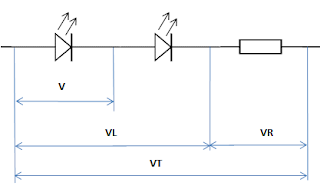 While the maximum reverse voltage is usually 5 volts. LED forward voltage is also often referred to as LED voltage drop. 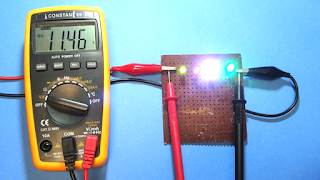 The YouTube video above shows a series of LEDs when tested with various voltage levels. The video shows that one LED can be turned on with a 3 volts CR2032 coin battery. 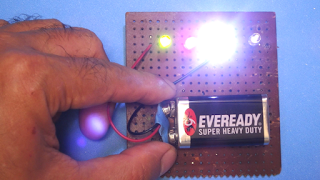 With a 9 volts Eveready battery, they are 3 LEDs arranged in series. Seen on video and photo above that the rightmost LED is not connected to the battery. And the brightest one is white LED. By using a 12 volt adapter, the number of LEDs arranged in series is 4 pieces. Seen in the photo above that all four LEDs are on. The multi tester display shows about 11.46 volts. This series circuit can be applied to 12 volts LED light for motorbike and car. Because vehicle electric system voltage can raise up to 14.4 volts, so 5 LEDs in series will be more durable to compromise that voltage raise. Rounded up to make it safer to 74 LEDs, and they can be connected directly to 220 VAC without transformer. But the video only uses 40 LEDs. Then there must be a resistor to limit the current supplied to those series LEDs. 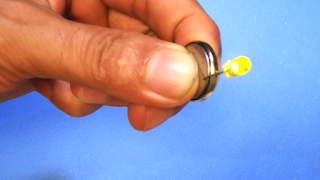 For 5 mm diameter LEDs, the maximum allowable current is around 20 milliamperes. 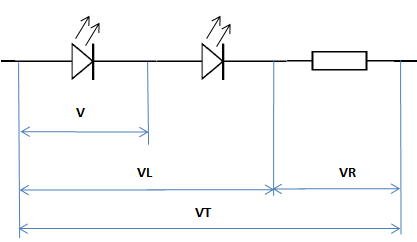 The supply voltage (VT) is 220 volts. The LED circuit voltage (VL) is 40 x 3 = 120 volts. But in the video the circuit is using 22 kilo ohms, because of safety considerations. And also, if the current is too big, the LED light is too bright so it can dazzle the camera. So using a 1 watt resistor is quite safe, it will not hot. If the resistor value is reduced to make brighter LED light, then the resistor power must be increased so that it does not overheat. 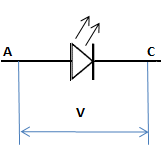 For alternating current, only half wave current is used to power the LED. The other half wave is stopped by LEDs. 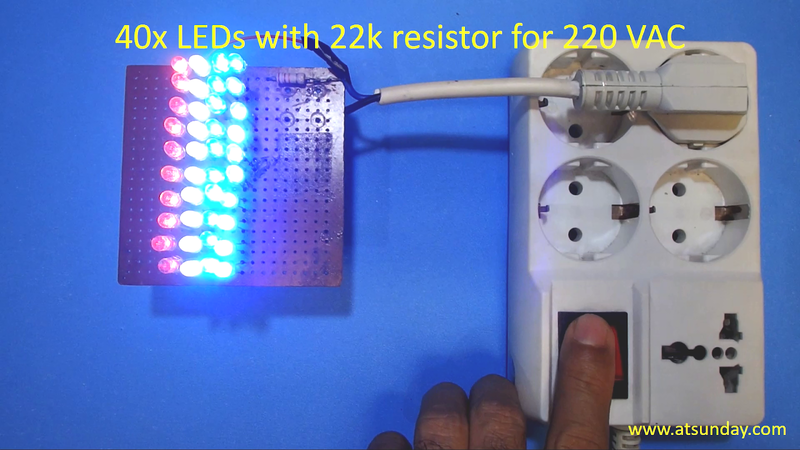 That is why the LED light in video looks like vibrating when the circuit is connected to a 220 VAC grid. WARNING: do not touch the circuit when it is connected to a high voltage grid.